Our gym routines when it comes to isolation exercises usually don’t involve our calves, which are one of the easiest muscle groups to completely forget about. Most people’s idea of an isolation calf exercise is a few standing raises, and that’s about it. The calves may not be the biggest muscles in our legs, but they certainly are important. The most popular sport worldwide known by most as football or soccer in the United States is highly dependent on the calf, as it controls the Achilles tendon which rotates the foot and determines where the ball is placed. If you are an athlete that plays volleyball, basketball or any other sport that involves jumping or leaping regularly, the strength of your calves are extremely important as well. How Can You Get the Most Defined Calves? Like with any other part of the body or any other muscle group, the most important thing when it comes to definition is our diets and eating healthy. More body fat means less muscle definition so make sure your diet consists mainly of lean proteins like beans, legumes, yogurt, chicken and turkey. Also make sure that most of your carbohydrates are coming from vegetables and whole grains. A good rule to go by is to avoid foods that are colored white. This means avoid white bread, bagels, process sugar, white rice and other white grains. These grains have been stripped of the bran which contains most of the fiber in the grain, which helps maintain proper blood sugar levels. You don’t want to be overeating when you are looking to get defined calves or any muscle, but you need to make sure you aren’t depriving yourself as well. Your muscles are going to require more calories to grow and for their maintenance so take that in to consideration when altering your diet. Another thing to consider when trying to develop calf muscles is that they are highly dependent on our toes and feet, and the muscles that lie within. Any ballet dancer will tell you that there are loads of muscles in your toes and feet which most of us are completely unaware of. Developing these muscles in your toes and feet can help you in developing your calves because in doing so you are essentially increasing your range of motion. This is a very similar concept to the one in fingertip pushups, or any other variation not performed with a flat hand. Increasing your range of motion means more fiber recruitment over a longer period of time which will help you not only gain more definition, but more mass as well. This is a variation of the simplest version that you can do, and is a great starting point if you are a beginner. The best place to do this is on a staircase, but anywhere there is a ledge like on the curb of the sidewalk can be used to do this exercise. To do this, stand up straight with your arms at your sides and hang the back of your feet off the ledge. The balls of your feet are in contact with the ledge but not your heel. Slowly lift your feet off the ground to where you are standing on your toes to complete one repetition. This is the exercise you want to do to build the most mass. You are sitting down so you are not engaging your secondary stabilizing muscles and thus should be able to lift more weight here. Perform this exercise like you would the calf raises on the stairs, except in a seated position. When many people do calf raises only using their body weight, they eventually reach a point where that isn’t enough resistance on the muscles to promote further growth. One simple solution to this is to use one leg instead of two which is not only challenging in that there is more weight on the single calf muscle, but it is more difficult to maintain balance as well. 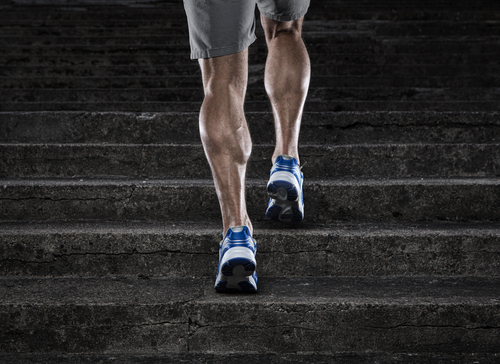 Perform this exercise in the same manner as you would the calf raise on the stairs. You may want to use a handrail or some other sort of assistance at first to maintain your balance while doing this to make it easier on yourself as well.